This is a new model made entirely from stainless steel. The base and the platter weight nearly 300kg, the platter is supported with a thin layer of air less than 1/1000 of an inch. 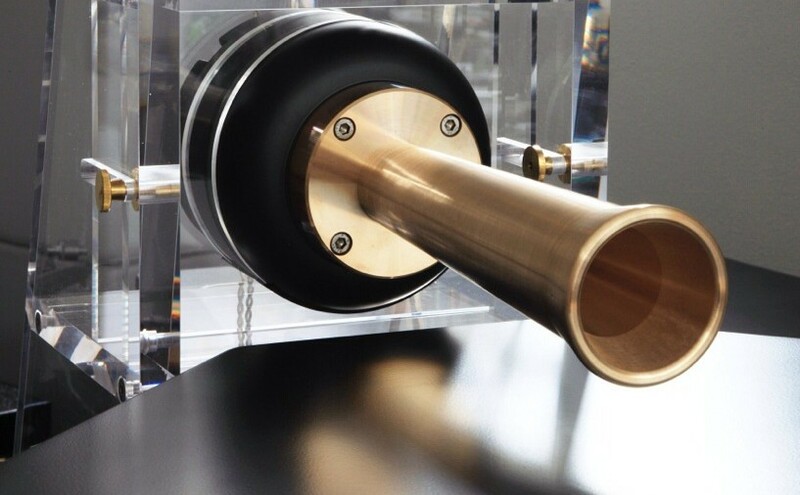 The design is bearingless, there’s not connection between the upper platter, spindle and the base, this insures complete isolation of the platter for undisturbed playback. This entry was posted in Phono, Turntables. Bookmark the permalink. All that stainless steel reminds me a little of the Epidauro 930? No? =) I haven’t seen or heard one of these. I will be on the look out and see if any Chicago area salons have one for a listen. I do not know the Epidauro but the machining and drilling is done with excellent tolerances and measurement precision. 1-3/100 mm – This is in Germany a good standard of turned parts, in the US an A (and especially in the TT-production) – a very good value. I am waiting for the centrality of the platter. Will let you know. Possible to find another one? I need to buy it. Could someone elaborate the history of this company? American Sound has it’s roots going back to the 60’s in Japan distributing American high end audio brands, record player production started in early 70’s with several prototype models and the design was finalized by mid 70’s to be the end all of all great turntables. Exact numbers are unknown but only a very limited number of American Sounds very produced in the years that followed up to early 90’s when it stopped completely. We made 6 of them in 1998 for one client and designs were made for slightly larger model that addressed the few minor shortcomings of the original but it never went into production but the design upgrades demanded extreme precision machining to even higher tolerances than the old model which made it cost prohibitive at the time and given the weak market for high end players back then the project was shelved until recently. Over the years those early units became highly sought after and went up in value as more people found out about them, given today’s demand for this level turntables and current market structure we have the opportunity to build a very small number of AS-2000 up to the required standard. Manufacturing started in 2017 with first unit delivered at the end of December 2017. By design the production is limited to one or maximum two very small runs in 2018, keeping the brand’s exclusivity and protecting longterm value for our investor clients is also one of our priorities.